For years my husband Chris and I have been looking around in church and noticing that there are not many (if any) people our age. Have you noticed it too? While our churches might have decent sized youth groups, once those kids graduate high school and head off to university they seem to stop coming to church. We find ourselves hoping that they’ll eventually come back to church, but if we’re being honest we will realise that a lot of the time they don’t. That is what Chris and I came to recognise, after years of attended church and having no Christians our age to share life with. So we ventured out with a few others in search of creating a church service designed to meet the needs of twenty- and thirty-somethings interested in finding out more about Jesus. And you know what… it worked! God brought people to our church, people our age who wanted to be in community with others who loved Jesus. It was so refreshing and fun. We suddenly had a network of Christian friends our age who we could do church with, do bible study with, and do life with. But then God called us to move to the United States, and when we got here we discovered the same old story… a distinct lack of twenty to thirty year olds attending church. So again I’ve started wondering, how do we reach twenty- and thirty-somethings who are outside of the church? Recently an old back injury flared up and at the point of desperation I cried out to Jesus knowing that I needed to do something about it. Yoga seemed like the most obvious answer. Now to give you a bit of background information, I’ve always resisted practicing yoga. Years ago I read a book called The Death of a Guru, by a Hindu Brahmin turned Christian who explained that Yoga was designed as a means to open your mind and body up to union with Brahman. It was important for me that I did not seek to be in union with anything but Jesus Christ, so I avoided doing yoga from then on. However, I am extremely inflexible and my back injury is exacerbated when I get too stiff and tight through my muscles, so I asked God whether it would be ok if I did Yoga at a local studio down the road. Sensing God say that it was OK, took myself off to yoga. After two sessions I cannot otherwise describe it as to say that I sensed God’s Holy Spirit say to me, ‘It is Good for you to be here’. Why, you might ask is it good for me to be practicing something specifically designed to open myself up to Brahman? Well, firstly, I believe the God I worship, Jesus Christ, is greater than any Hindu god therefore I have nothing to fear in attending these classes, but secondly because all those twenty and thirty-somethings who aren’t in church are doing other things, like yoga. Honestly, I’ve never seen so many girls and guys my age all in one room together – this yoga studio is a mission field! So while I’m attending yoga I am seeking to gain a better understanding the worldview of people outside of the church, to know and appreciate where they are coming from. But this is also a chance for me to step out of my ‘Christian Bubble’ into the world and mix with people who do not know Christ. Dan Kimball in his book They Like Jesus But Not The Church says that there are two chasms that stand in the way of those in the world accepting Christ. The obvious one is the Cross, but the other one which we often don’t recognise is Christianity itself and the Christian subculture that we have created, which causes so many outside of the church to have a negative reaction to us. It is essential that we build bridges over these chasms and seek to remove the barriers which stop people from even considering Christ. We need to get out of the safety net of our christian subculture and start interacting with the world, befriending those outside of the church and building trust with them. For we live in a world where many twenty and thirty-somethings admit to being on a spiritual quest to find purpose and meaning in life, but they never stop to contemplate Jesus, who is the way, the truth and the life. These people are probably not just going to walk into our churches, so we need to get out into the world and show them who Jesus is and how much he loves them. So my challenge to you is this – if you look at your life and your social group and find yourself surrounded by Christians then make a commitment to step out of your Christian Bubble and into the world. Ask God to show you where He would like you to spend your time and with whom He’d like you to spend time with. 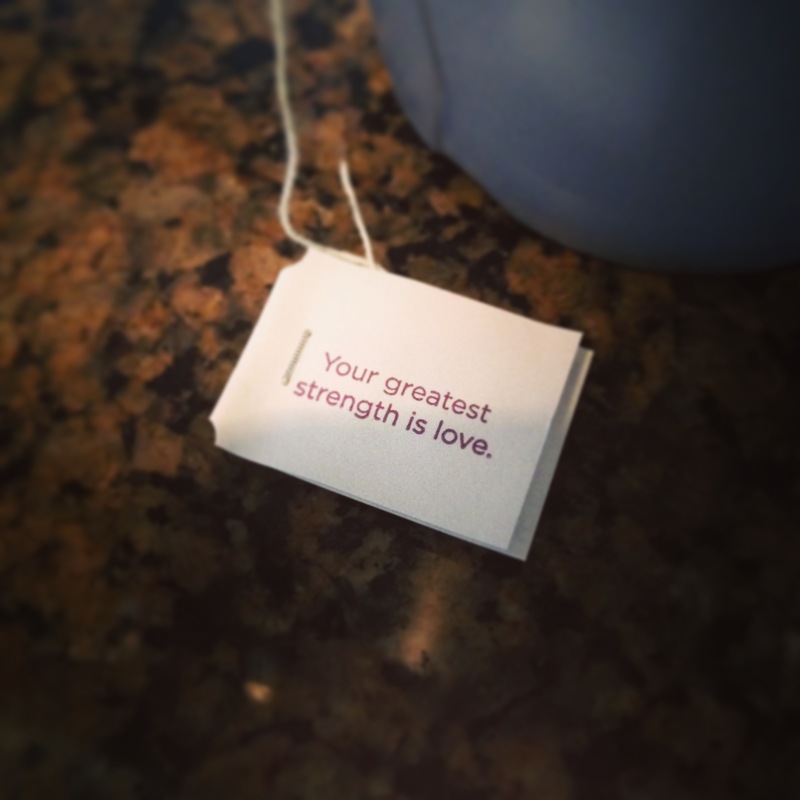 It may not be at a yoga studio, it may be a coffee shop, or in a sports team or a book club. Wherever it is, let’s get out into the world and win some hearts for Christ! In all honesty, if I did not believe in Jesus Christ as my Lord and Saviour I can guarantee you that I would not hold the values, morals and views that I do. In other words, God has made me more like Himself rather than the other way around. 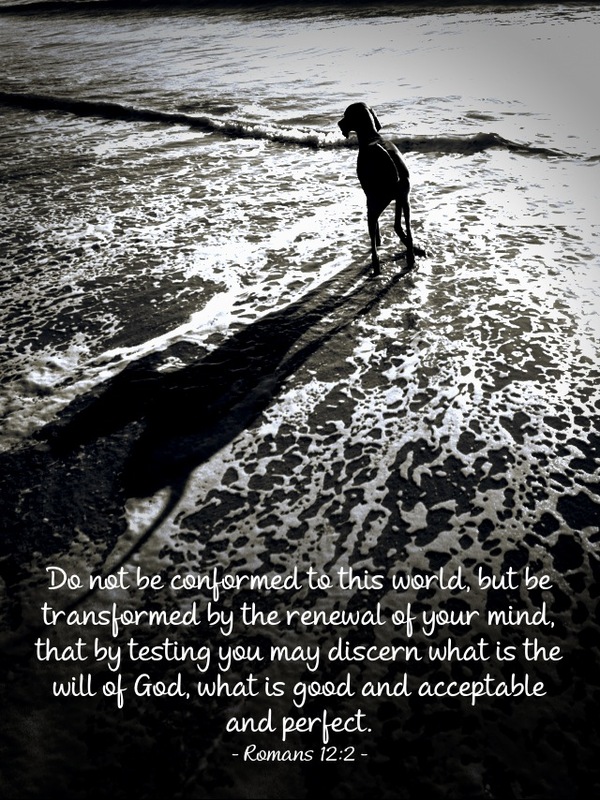 Romans 12:2 says, “Do not be conformed to this world, but be transformed by the renewal of your mind, that by testing you may discern what is the will of God, what is good and acceptable and perfect.” And in Isaiah 55:9 God says, “For as the heavens are higher than the earth, so are my ways higher than your ways and my thoughts than your thoughts.” God is anything but an imaginary friend who concurs with individual opinion and judgement, and He is not a “Yes Man” whom we can call upon to agree with us whenever we need Him. Quite the opposite, God calls His followers to live a “more excellent way” (1 Cor 12:31). He calls believers to love (Mt 22:37-40). He calls us to not only love our friends, but our enemies also (Lk 6:27). He calls us to forgive those who hurt us (2 Cor 2:5). He calls us to show compassion, mercy and grace. To have integrity. To be humble. To have patience. To be meek (which means to be humbly patient under the provocation of others). This is the way of life that God calls Christians to and He has given us the perfect example of this life in His son, Jesus Christ. As humans, sinful and proud, it can be a real struggle to love others, especially those who hurt us and it is a real struggle to be forgiving, compassionate, gracious, humble, patient, and meek. Therefore, this call to love, and love unconditionally shows us that God’s ways are truly higher than human ways, His thoughts higher than human thoughts. For me to believe in God is not to have my thoughts, opinions and judgements reinforced, instead it is a constant challenge (and encouragement) to change, to grow, and to become more like Jesus Christ. It is a call to live in a manner that is good, acceptable and pleasing to God. I am truly sorry that the woman being interviewed the other day felt that religious people were just calling upon an imaginary superpower to give the “tick of approval” to their opinions. As is my experience, to believe in Jesus Christ does not let me get comfortable in my thoughts and opinions, instead it calls me to a more excellent way. 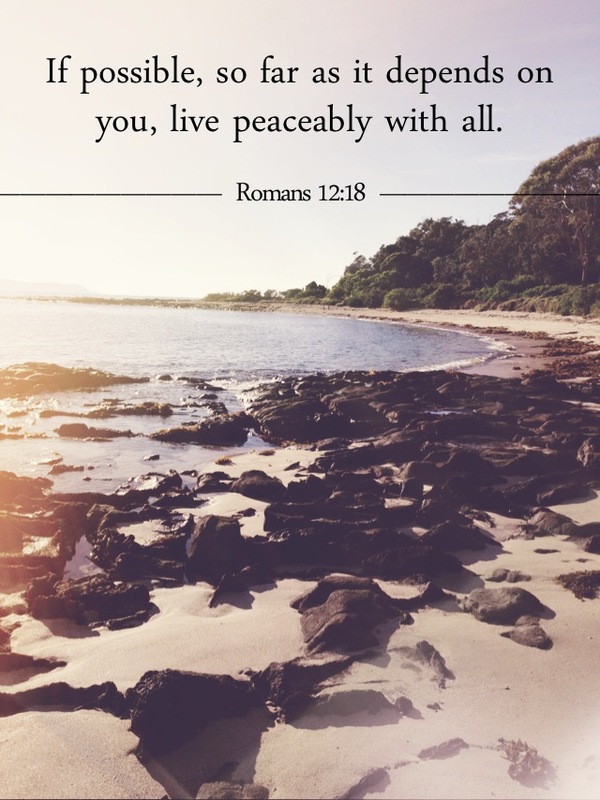 The other day as I was reading through Paul’s letter to the Romans I was struck by what he says in chapter 12, verse 18 which is, ‘If possible, so far as it depends on you, live peaceably with all.’ Wow! Such a simple sentence but I feel that it contains so much more meaning than what first meets the eye. It has left me wondering, what does living peaceably with all actually look like? At first glance there are the obvious things that you would do to ‘live peaceably’ with all, such as treating people with love, patience, kindness, gentleness; those things which are the fruit of the Spirit (Gal 5:22-23). In addition that you would want to come to all people with a compassionate heart, with humility and meekness, bearing with them and forgiving them, just as Paul encourages in his letter to the Colossians (Col 3:12-14). These behaviors are all right and good for us to exercise when relating to other people, but they are all the external out-workings of living peaceably with others. However, as I pondered on all of this I began to ask whether living peaceably with others actually starts from the inside out. Can we truly treat people with compassion, kindness, gentleness, humility and love if internally we do not feel those things towards them? Can we truly live peaceably with others when on the inside angry, jealous or ill-natured thoughts towards them are taking over. I tend to think that it is not possible to do so. Over the last year I’ve been struggling with the hurt and pain of being deserted by friends who I considered closest to me and at a time I needed them the most. It has been a heartbreaking experience and it has affected our friendships significantly. The thing is, they have no idea that they have hurt me and so the breakdown of our friendships has come from my end only. In not being able to deal with my pain I have withdrawn from them, and at times I have been consumed with angry, unforgiving and wrathful thoughts towards them. Consequently I have not lived peaceably with them, loving them, being patient with them, being compassionate, kind, bearing with them and serving them as they have needed. This has led to a huge internal conflict for me because I know what God asks from me as a believer in Christ, but I have struggled to follow through with it from the inside out. Recently, in all of this, God has been showing me that He has allowed this feeling of desertion so that I would not rely on my friends for comfort but that I would cling to Him for all that I need. This was just the perspective that I needed. From this I have been able to realize that living peaceably with others actually starts deep within, by virtue of the thoughts of my heart. It is about seeing others as God sees them, recognising that Jesus died for them just as he died for me and that the love God has for me He also bears for them. It is understanding that people are often dealing with their own struggles and therefore don’t have the capacity to give. It is about being willing to be humble, compassionate and forgiving. It is wanting God’s best for others in all things. By seeking (with God’s help) to change the thoughts of our hearts we can truly begin to live peaceably with all, from the inside out.